Regnier Gemma Frisius was a native of Friesland, a coastal province in northern Netherlands, which explains why he gave himself the name of Frisius. He was born Regnier Gemma and only adopted the name Frisius when he later became a scholar for, like many scholars from his country, he adopted a Latin version of his name. So Regnier Gemma became Gemma Frisius. His parents were very poor people and both died when he was still a young child. Left an orphan and a cripple, he was brought up by his stepmother who on a special feast day, when Gemma was six years old, took him to the shrine of St Boniface in Dokkum. Certainly after this his legs which could not support his weight became stronger and his family believed that he had been cured by a miracle. Certainly given the difficult start he had in life it was indeed a miracle that he was able to achieve so much but, however, he remained a frail person all his life. 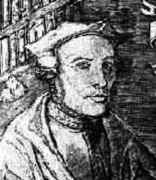 Gemma attended school in Gröningen then, in 1526, he entered the University of Louvain. Of course his stepmother did not have the means to support him financially through university but he was given a poor student's place in Lily College. He studied for a medical degree but remained at Louvain to study mathematics and astronomy. He went on to become the leading theoretical mathematician in the Low Countries and also to become professor of medicine and mathematics at the University of Louvain. He was also a practicing physician in Louvain. was certainly a completely new printing by the Antwerp publisher Roeland Bollaert. Gemma's edition contained very few changes to the original text, but Gemma had made some alterations to some of the maps, particularly to 'America'. Gemma showed 'America' as two disconnected continents with the one south of the equator being named America while the one to the north of the equator was left without a name. It is reasonable to ask why Gemma Frisius would produce a new edition of Cosmographia within five years of the original with relatively few changes. Cosmographia provided a layman's introduction to such subjects as astronomy, geography, cartography, surveying, navigation and mathematical instruments. The 1524 edition published by Apianus himself was not very popular and Gemma Frisius may have seen the potential to develop it into a more popular work. He may also have seen the potential of producing and selling in his workshop the mathematical instruments described in Cosmographia which would then provide an outstanding advertisement for his wares. This was indeed what he went on to do. ... a geographical globe with the most important stars of the eighth celestial sphere. The full Latin title of this work translates to On the Principles of Astronomy and Cosmography, with Instruction for the Use of Globes, and Information on the World and on Islands and Other Places Recently Discovered. It was a work in three parts published in Antwerp by Johannes Grapheus (Gemma's original published Roeland Bollaert had died). The first part described geographical and astronomical terms such as latitude, longitude, meridian, poles, eclipses, signs of the zodiac etc. The second part described how the globe could be used while the third part vividly described for the reader the peoples, plants etc. in distant lands. ... it is with the help of these clocks and the following methods that longitude is found. ... observe exactly the time at the place from which we are making our journey. ... When we have completed a journey ... wait until the hand of our clock exactly touches the point of an hour and, at the same moment by means of an astrolabe... find out the time of the place we now find ourselves. ... In this way I would be able to find the longitude of places, even if I was dragged off unawares across a thousand miles. ... it must be a very finely made clock which does not vary with change of air. In a second edition of the work three years later he added some notes about finding the longitude at sea, the first time anyone had attacked the problem. It is worth noting that although there were many methods of finding longitude proposed in the 250 years following Gemma Frisius's work, ultimately the methods he proposed were to become the solution to finding the longitude at sea. In 1533 Gemma published an enlarged edition of Cosmographia which became a great commercial success. He included with this work Libellus de locurum which described the theory of trigonometric surveying and in particular contains the first proposal to use triangulation as a method of accurately locating places. The Polish ambassador in Brussels became aware of the outstanding work being undertaken by Gemma Frisius and invited him to come to meet him at the Imperial court in Brussels. There he tried to persuade Gemma Frisius to go to Poland to collaborate with Copernicus. It was an interesting proposition which was very tempting but, after some indecision, Gemma decided to turn the offer down and he returned to Louvain. ... not entirely a discovery of mine. [I have] augmented the ring so much that from simply showing the hours of the day and the four directions it now rivals whatever mathematical instruments you will. [Many ideas of others are] brought together into this single ring. His work on applying trigonometric methods to astronomical problems led him to note correctly that comets displayed a proper motion against the background stars. ... to publish a globe or sphere of the whole world on which the recently discovered islands and lands will be added, which will be improved and enriched and more beautiful than their earlier globe. [It will] make mathematics more illustrious ... keep alive the memory of old kingdoms and events and ... make known to coming generations our time and our realm in which ... very many islands and areas unknown in earlier centuries have been discovered ... [The celestial globe will be] for the general use of enthusiasts. Gemma Frisius, doctor and mathematician, ... from various observations made by geographers. Gemma Frisius, doctor and mathematician, Gaspard Van der Heyden and Gerard Mercator of Rupelmonde. After this Gemma went on to produce a world map which is described in  as 'influential' but sadly no copies have survived; see  for further details. In 1542 an army swept towards Louvain and the students formed a defence force. Gemma assisted the students, spending four days on the city walls keeping watch for the approach of the attacking forces. After a siege lasting only a few days the students opened fire from the walls of Louvain and, rather surprisingly, the siege was lifted. Gemma's work on astronomical instruments was described in several of his books. For example in De Radio Astronomico (1545) he described his work constructing a cross-staff about 1.5 metres long with one cross piece about 3/4 of a metre in length. It had brass sighting vanes and a sliding vane. He also invented a new astrolabe which he described in De Astrolabio which was published in 1556, after his death. ... the first astronomer's staff in brass that was devised by Gemma Frisius; the two great globes of Gerardus Mercator; and the astronomer's ring of brass as Gemma Frisius had newly framed it. Gemma Frisius made many astronomical observations. In particular he recorded comets in July 1533, January 1538 and 30 April 1539. Some of these comet observations are described in works by his son, Cornelius Gemma Frisius, who was born in 1533 and went on to become professor of medicine and astronomy at Louvain. Gemma Frisius died of 'stones' at the age of forty-seven.